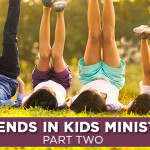 Do you wonder about the future state of kids ministry? How will our quickly changing culture affect how we serve kids and families in our churches? Well, this year, we’ve had the opportunity to connect with some pretty dynamic kids ministry leaders across the country who have all been in small, medium, and mega church settings. This two-part blog will feature what we perceive as current trends in children’s ministry. Today’s blog features some potentially negative trends. Don’t be dismayed, however, as our next blog features some positive movements. The bottom line is this: God is positioning His church to be a light in the darkness. The gospel shines brightly in the darkness. He’s placing vibrant kidmin leaders in a position to shape the culture of their churches and communities. One glaring idea that has risen from discussions with these leaders is that it’s important to partner families with Jesus. The church is the bridge of that partnership. Here are some not-so-positive trends noted by various kidmin leaders. Much thanks goes out to these voices in kidmin. Add yours in the Comments section below! Jeffrey Reed serves on the leadership team for LifeWay Kids. He came to LifeWay with a wide variety of ministry experiences including worship leader, director of children’s ministry, and executive leadership in several growing congregations. He, his wife Katherine, and their four kids attend Rolling Hills Community Church in Franklin, TN.